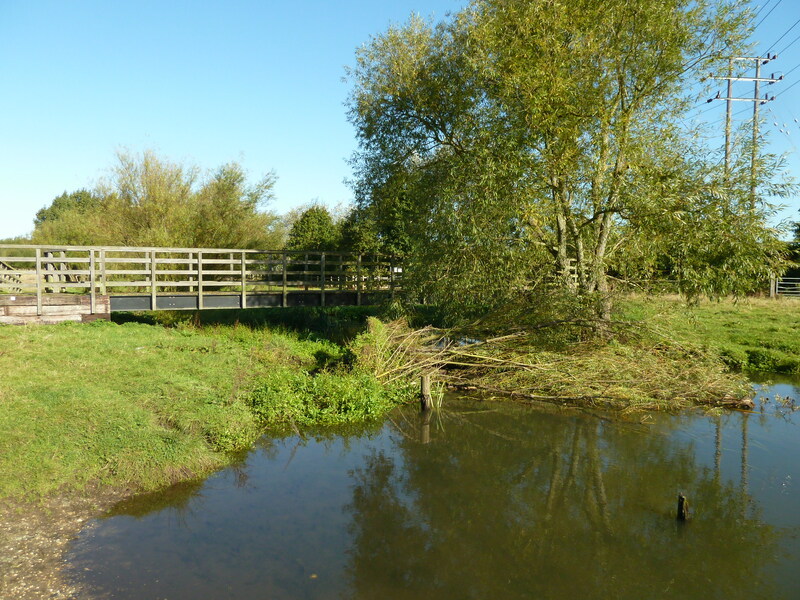 Back in 2012 a small willow tipped over into the River Blackwater at Hawley Meadows. Usually we retain trees in the channel as they help to reduce flooding by slowing down the flow and also increase biodiversity. 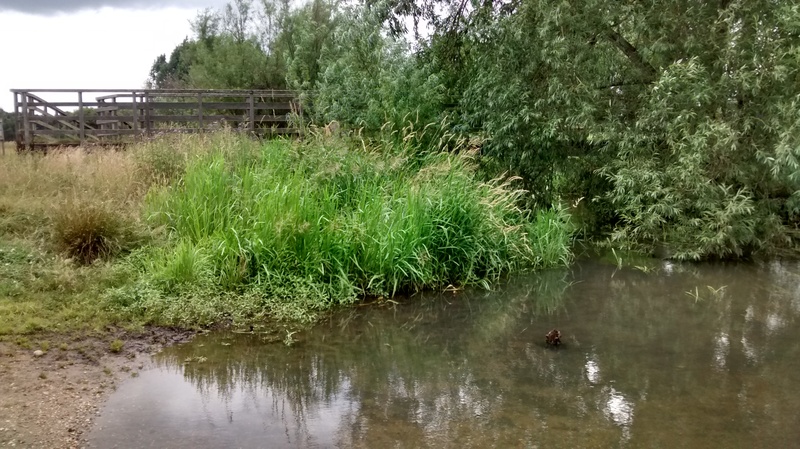 Working with the Environment Agency we have carried out several river restoration projects on Hawley Meadows and the wider River Blackwater, including installing wood in the channel and creating riffles for fish breeding. In this case, with the location of the fallen tree up-stream of the bridge by the car park, we were concerned about the risk of undermining the western bridge pier. This proved correct, when a month later the river had already scoured out behind the tree and incised the river bank, so we booked in a task. Chris came out and lent a hand as I chainsawed off the fallen tree in the river, then fixed the tree root-plate back in place. We also pegged in hawthorn faggots. These bundles of brash help to secure the bank and slow down the river flow to promote settling of sediment. 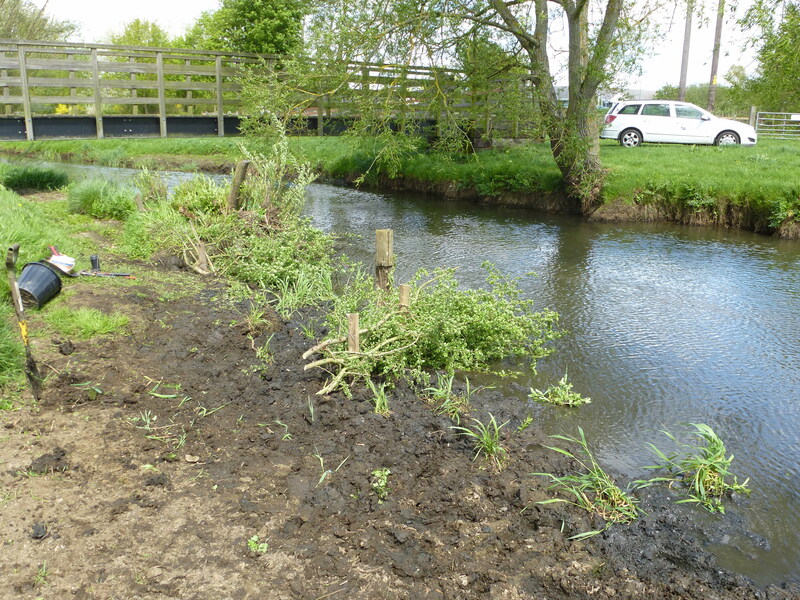 Last week during our River Restoration Training from Steve, I was very pleased to see our efforts have worked, as the eroded bank has now reformed and stabilised with vegetation protecting the bridge pier. 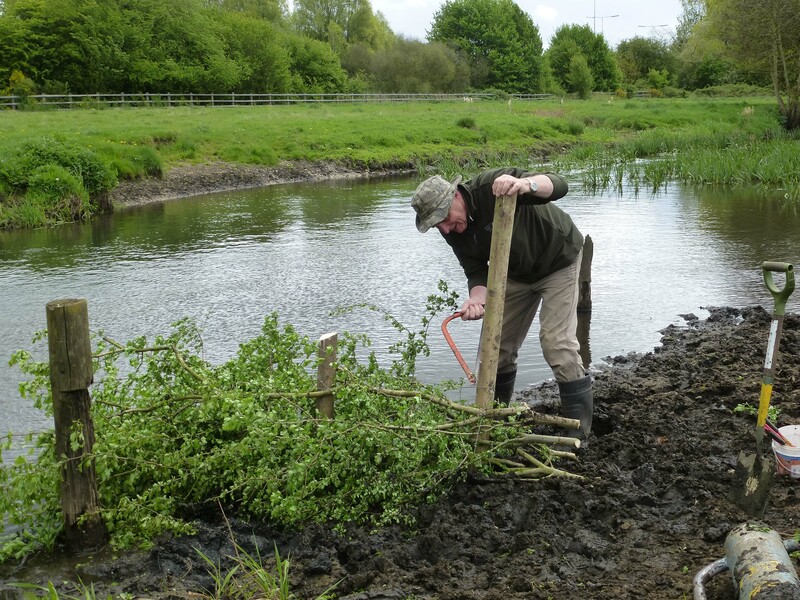 On the week beginning 18th September we’ll be hosting River’s Week, and inviting people to join us in improving the biodiversity of the River Blackwater. Watch this space for more details nearer the time. This entry was posted in Conservation, Hawley Meadow, River, Volunteers and tagged trees, Tuesday Volunteers, Volunteers. Bookmark the permalink.